> Motorola > Manufacturing Case Study- Cost Effectively Improve Long Distance Communications. When a company grows, the communication has to grow with it. When handling food, timely utilization of perishable raw materials becomes a critical issue. To sustain continuously improving quality levels and timely delivery, Georgia Nut Company needed a communications system that would improve Communication between dispersely located facilities, clear audio in noisy work environments, and enhanced and reliable coverage. MOTOTRBO, a digital communications system with repeaters that are linked via Internet Protocol (IP). 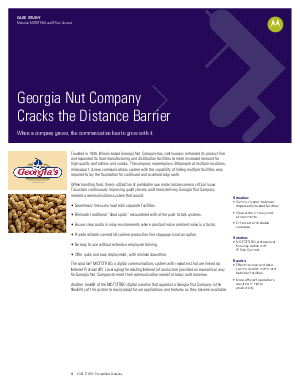 Leveraging the existing Internet infrastructure provided an economical way for Georgia Nut Company to meet their communication needs for today and tomorrow.